TBH | What Does TBH Mean? TBH, I preferred your old hairstyle. Like my recent (LMR) picture, and I'll post some TBHs. Of note, TBH was originally used with a blunt or slightly antagonistic statement to suggest the statement derived from sincerity. In other words, TBH was used to protect the author of an overly candid statement by serving as a caveat with the meaning "I'm only telling you this because I am being truthful." However, TBH has become so common on social-media platforms like Facebook and in chat rooms, its meaning has now been diluted. 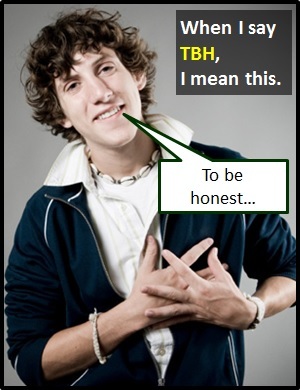 The meaning of TBH can now range from "I think..." to "I'm sorry for being blunt, but..."
This image shows a man holding his hands over his heart, which is a common gesture to portray sincerity. Person A: Did you enjoy my party? Person B: TBH, I didn't like the music. Person A: Do you really think that selfie made me look like a hamster? Person B: That's my TBH. I don't like your new boyfriend tbh. Do you want my TBH?